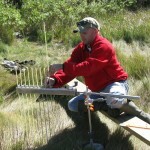 Monitoring salt marsh elevation change using SETs. Water quality parameters are monitored year round at the Reserve by deploying data loggers programmed to collect data every 15 minutes. 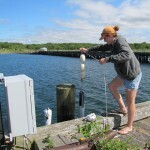 Dr. Candace Oviatt, visiting researcher, collecting benthic samples around the Reserve a few years ago. 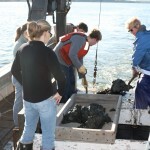 One of the core functions of the Narragansett Bay Research Reserve is to support and conduct high quality research and monitoring with a focus on the Reserve’s mission to preserve and protect representative estuarine habitats within Narragansett Bay. This is facilitated by a coordinated Research and Monitoring Program, which is staffed by a Research Coordinator, a Marine Research Specialist II, and a seasonal research technician. 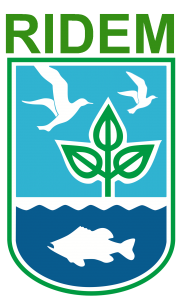 The NBNERR Research program seeks to develop and enhance cooperative partnerships and to integrate with other Reserve programs to conduct and disseminate original research in the Reserve throughout coastal Rhode Island. In addition, the Reserve serves as a long-term platform for external scientific research that spans a variety of disciplines. Examples of projects conducted by visiting scientists can be found here. 3) supporting visiting researchers to the Reserve. More broadly, research and monitoring in the Reserve is guided by a set of vetted research priorities. Biographies of Reserve research staff can be found here.